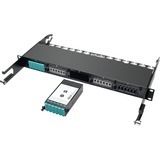 The N482-12M12-X2 40 GB Pass-Through Cassette works in tandem with Tripp Lite's N482-01U or N482-02U Fiber Enclosure Panels to create up to twelve 12-fiber MTP/MPO connections in high-density network applications. 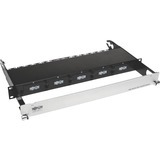 The cassette's modular design installs easily in the N482-01U and N482-02U enclosure panels with no tools required. 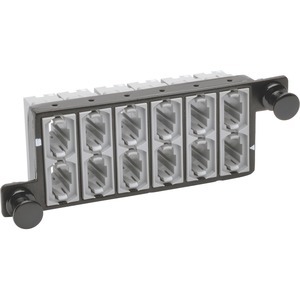 Just insert the cassette into the panel, and push in its retention clips to secure it. 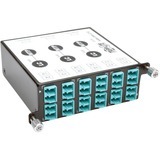 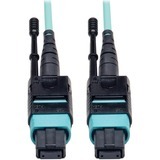 Plug 40 GB 12-fiber MTP/MPO patch cables into the cassette to connect up to 12 network feeds. 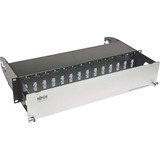 Up to five N482-12M12-X2 cassettes fit in the N482-01U 1U enclosure panel for a total of 60 network feeds, and up to 14 cassettes fit in the N482-02U 2U panel for a total of 168 network feeds. Guaranteed compatibility when used with recommended Tripp Lite cabling. 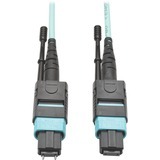 Designed specifically for use with Tripp Lite cables, such as the N842- and N844- Series cables.With a heavy-duty steel housing and factory-terminated connectors that reduce time and labor, the N482-12M12-X2 is made from only the finest materials to ensure fast installations and optimal performance.